Yeah I noticed that and thought that I was missing something with the Gold Jersye, guess not, can't wait to see what you come up with. Here's a potential update to the Fire. 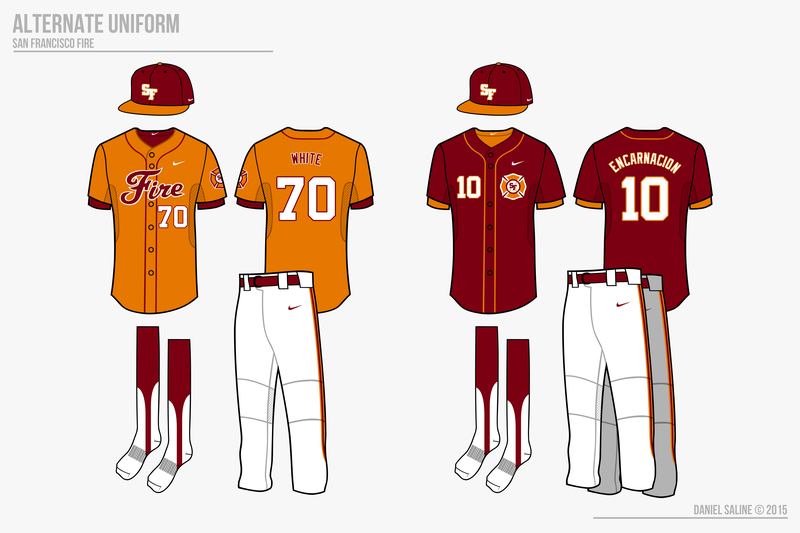 I didn't like the fire script on the red jersey because it didn't look all that consistent and I like the idea of a colored jersey matching its primary. 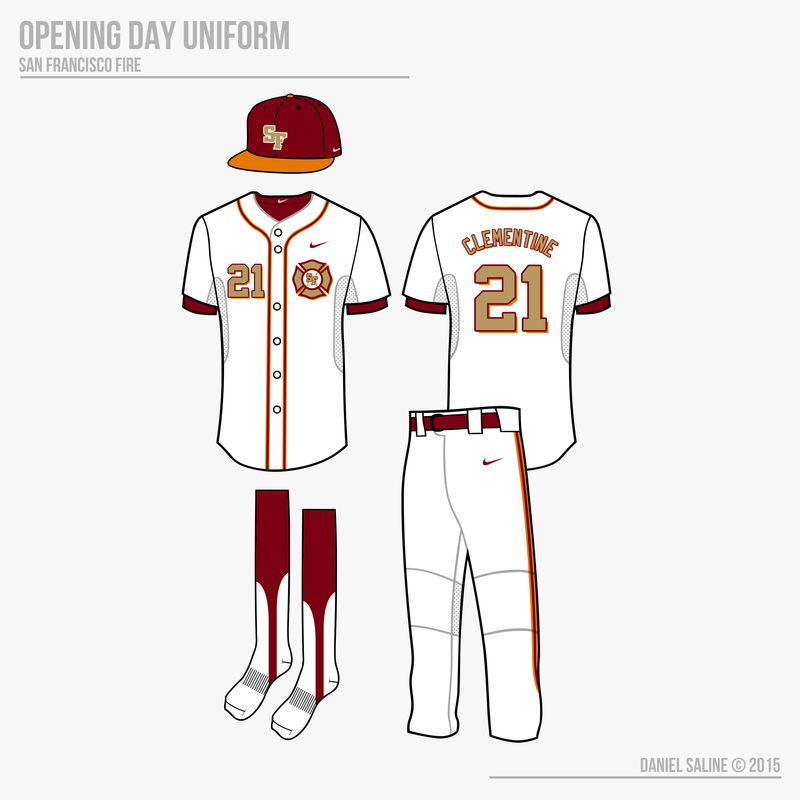 Not to mention I think fans would like the orange jersey script much more if it only appeared on one set. I think that creates a lot more realism here. I went with your guy's suggestion with the cap and Opening Day set. I also enlarged the "AN" in San Francisco a bit on the road script. Great update dsaline! The hats and championship jersey look much better. I see where you're coming from on the red jersey. Make the script more of a novelty thing. It's a hell of a script, though. The San Francisco Fire have been updated in their original post. Meanwhile, we've reached the All Star Break! 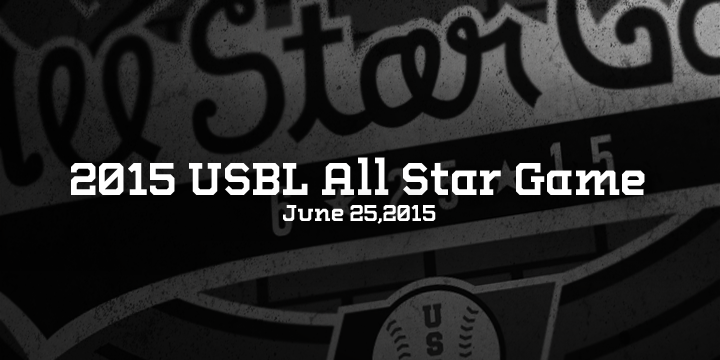 The 2015 USBL All Star Game is this Thursday, June 25. The location and logos will be released soon. 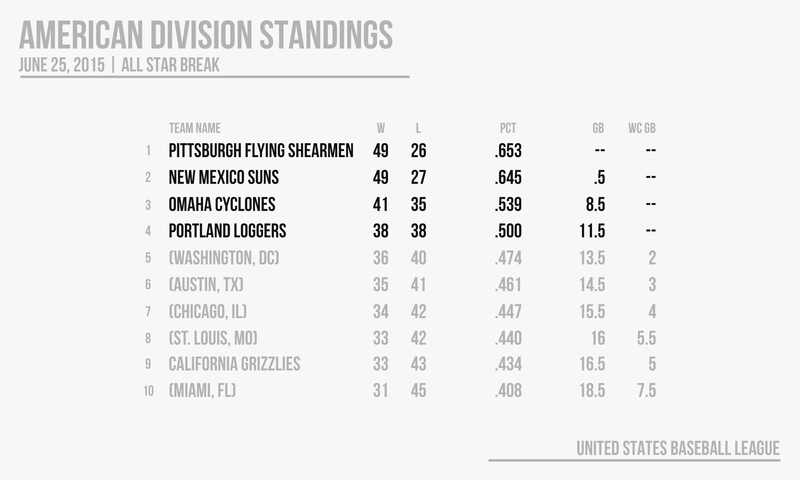 Here's a preview of the logo as well as the standings at this point. Looks like you're getting a sneak peek at the markets, too . Once again, no suggestions on markets or names. I know what I'm doing, or at least I'd like to think that . If you've got questions about your team at this point, I'd love to answer those! Team #13 will be out...at some point. I'm not entirely happy with it and am going to make some changes, but if I can't get anything right away I'll move the next team up a spot. The thought right now is navy and kelly-ish green, but I'm not set. Does that work? I am solely going by the assumption that New York is the biggest rival to Boston. So I wouldn't use any black in the uniform. I was thinking like a Navy and White, but a Kelly Green is good. Looks as if my Grizzlies aren't doing so well. 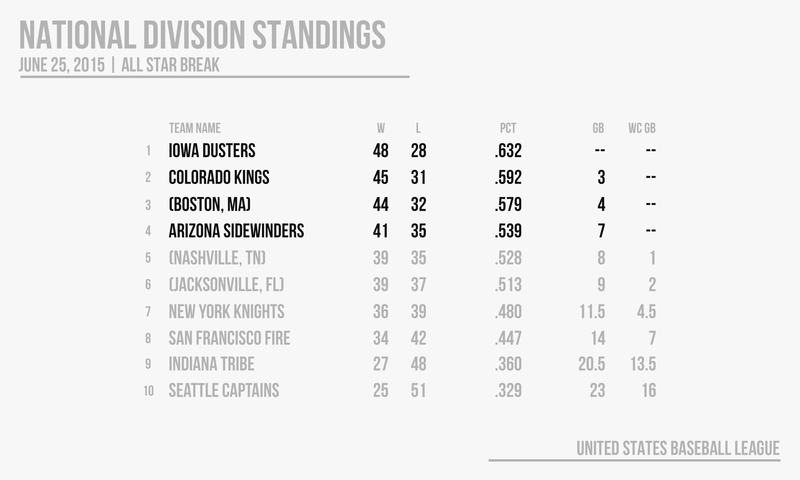 On another note, you should alter the schedule so that each team plays 81 games until the All-Star Break. New York is navy... it is pretty dark, though. Like the Bears or Indians. I thought about using a two color scheme, but I was trying to not make them a Yankees ripoff, which I'd assume Bostonians on here wouldn't appreciate. And also, do you have a formula for a schedule (if you're implementing one)? I was thinking along the lines of: each team plays 108 games against their division, 54 against the other. Each team plays 12 games against all members of their division, and 5-6 games interleague, playing all teams. Intradivisional match-ups will be all in 3 game series, allowing for 2 home and 2 away. Interleague match-ups would be two 3 game series or a 3 game series with a 2 game series. What do you think? Even though this is fictional, I am definitely having fun thinking about different things for the league. Maybe go with the Celtics route and use only Green and White? The Grizzlies are in an interesting spot. Curry and Layne are starting to carry their weight more, and a 24-year-old Tim Henderson is starting to excel in the #3 pitcher role. It certainly doesn't look like they'll be in the cellar, but I'd expect nothing higher than fourth place come playoffs. And also, do you have a formula for a schedule (if you're implementing one)? I was thinking along the lines of: each team plays 108 games against their division, 54 against the other. Each team plays 12 games against all members of their division, and 5-6 games interleague, playing all teams. What do you think? Even though this is fictional, I am definitely having fun thinking about different things for the league. I use OOTP which is why the ASG is in June (believe me, it'd be after 81 games if I knew how to change it). I'm not really going to put a lot of work or anything into the scheduling, but there is a lot of interleague play because there's only 20 teams), though. I could do that. I don't have much work done on Boston, so I've been trying out a lot of schemes. Black/grey, blue/grey, blue/green, etc. I'm trying to give them a fairly unique scheme, but they are another old team (Est 1930). I'll take any suggestions for colors. Green/Grey/White perhaps? 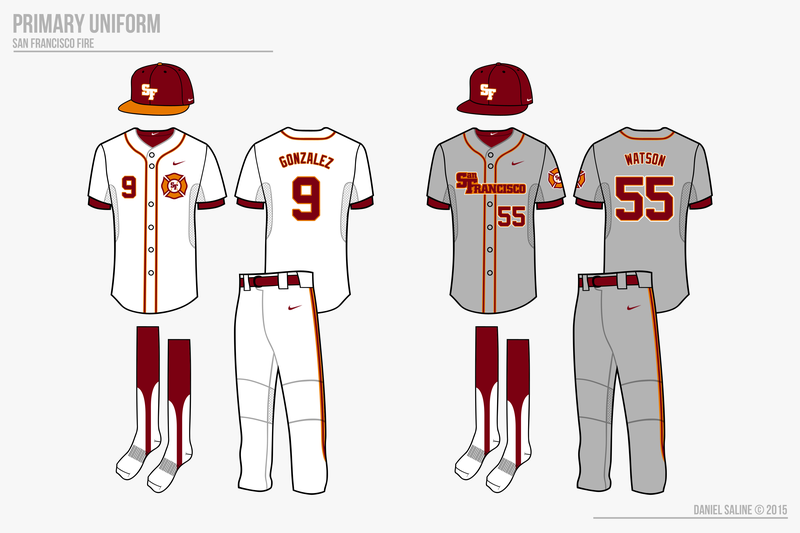 Or Grey/White team. I like the green/grey/white idea. That may be the one. Nice, can't wait to see Boston. I might be a little late, but I would love to see navy and kelly for Boston. I like navy and kelly because it gives some uniqueness. Right now (not including Boston), there's 5 primarily red teams, 6 blue, 4 green, 2 brown, 1 black, 1 purple. I don't know if 7 out of 20 is excessive for a single color, but I don't want a black and green team (I have two of those). So any suggestions for a secondary color to kelly green are welcome at this point. In a perfect world, Team 13 will be up tomorrow afternoon. I have to write the story in them yet, as I'm a bit caught up with a college app, but it should be good to go by then!